This is an absolutely stunning vintage 10k yellow, rose, and white gold ring. This lovely ring has gorgeously ornate shoulders and a very detailed rectangular-shaped setting. The setting is solid white gold, with rose gold on the four corners. It holds an assumed cushion shaped synthetic ruby stone, in the center of the ruby stone is a white gold diamond shape. In the middle of the white gold is a genuine tiny diamond. 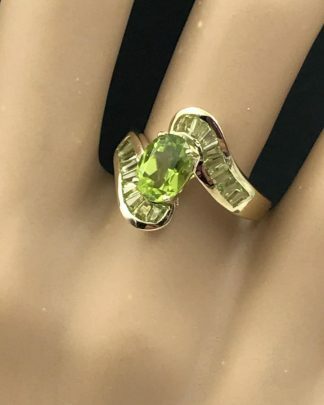 The yellow gold in the ring is on the part that goes around your finger. 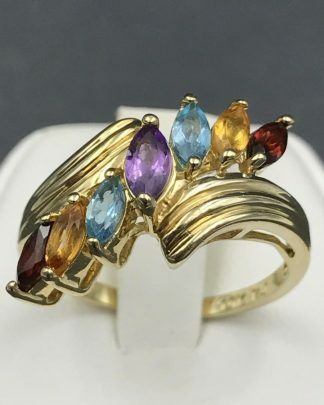 Lovely vintage ring set in solid yellow, rose, and white gold. Possibly from the 1940-50’s. The statement piece on top of the ring is 13 mm long, 5.9 mm wide, 14.8 mm high. Very unique and rare piece. Good shape for its age. Does appear to have been resized in past. Hallmarks: the inside of ring band is stamped “10K” – Last picture is zoomed in on the marks.